On recently being interviewed by Harry Potter with a beard in an East London warehouse, I left feeling somewhat disconcerted. Start ups are invariably formed by young people and the “Creative Director” interviewing me must have been no older than twenty-two. Here I stumbled upon the modern zeitgeist and felt like a pawn in a profound demographic shift; one where age is irrelevant and children born and shaped by the internet will rule the world. 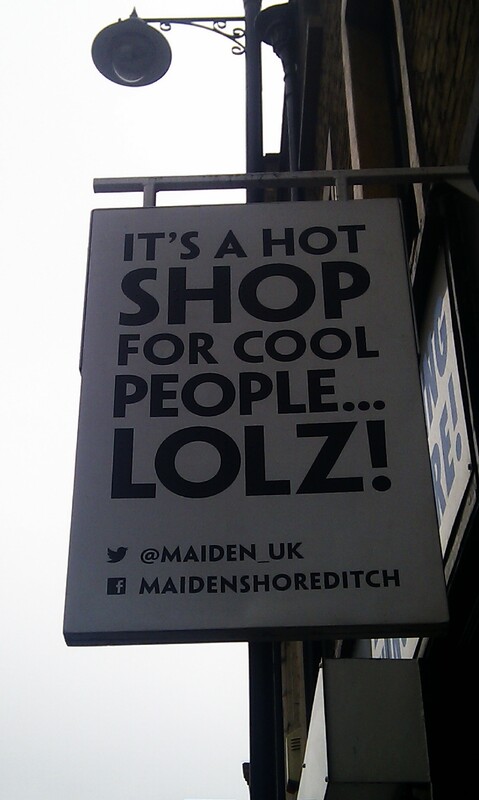 Despite living in Hoxton for nearly three years I’ve never fully embraced the East London lifestyle. Self-consciously quirky and dripping with acid, even the street art appears alien and vacant. With the big drinks and footwear corporations imitating the guerrilla artists in Great Eastern Street, I sometimes struggle to differentiate between rebellion and multi-national profit. When young residents tweet references to themselves as “wankers” as a form of cheery endearment, it’s like we’re all permanently trapped inside a hyper-capitalist matrix where nothing will ever change. Post-modernism is a passive condition entirely dependent on technology. Ironic mocking is therefore all we have left. By paying homage to media fashions, converts will embrace parody to demonstrate their wit and intelligence but they are born within this system and can never leave. There is no future, only a recycled past. 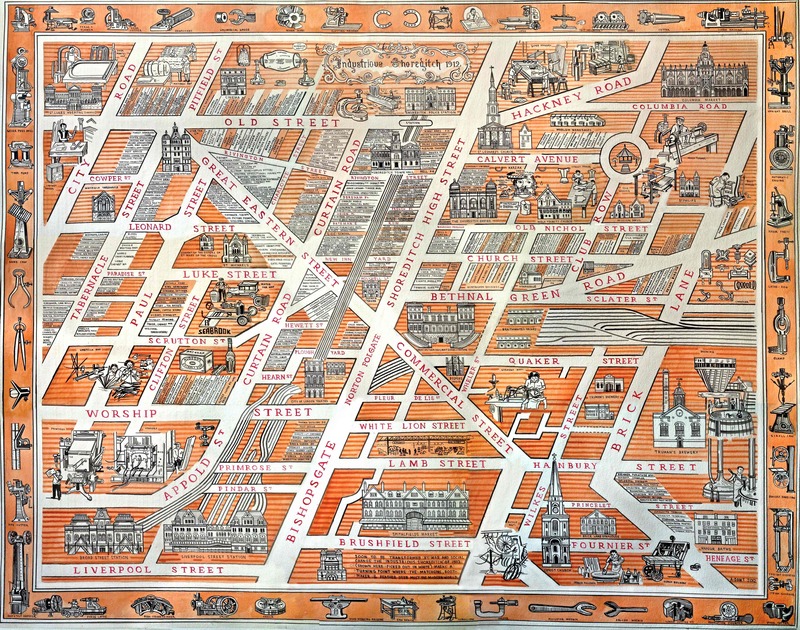 Satirising a contemporary urban world, Adam Dant‘s cartoon exhibition Soerditch, Diary of a Neighbourhood offers an irreverent guide to Shoreditch. 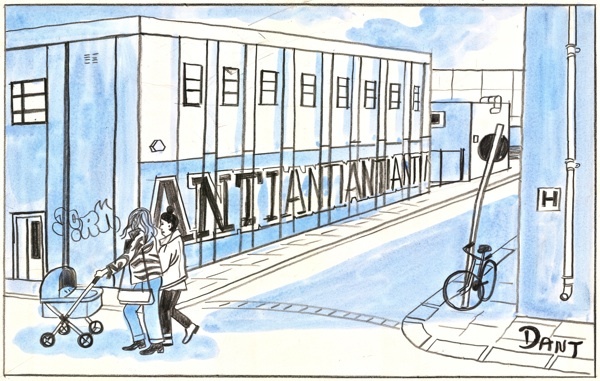 Embracing an irreverent newspaper aesthetic, Dant’s sketches provide a mocking guide to the area’s post-1993 residents. And what is most striking about “Tech City” and its glitterati of Wifi-workers, street food vendors and Harry Potter capitalists is the abandonment of history. There are no longer any relationship with the dead and the Victorian furniture factories have long been scrubbed clean of their industrial residuum. With East London’s past shucked out within a generation, the old warehouses and churches are like fumigated skulls. They are merely an interim host that will exchange hands every thirty years. While the deceased residents of Shoreditch are ignored their buildings live on vicariously without them. Originally assembled by coarse working hands, there is a natural hierarchy with age and somehow an older building is considered more ‘real’ than something new. History provides an emotional backbone that modernity with all its superficialities and globalised rootlessness cannot. By mapping this technological and leisure society, Dant’s cartoons provides a wry sense of character and warmth to the area. Shoreditch’s transformation from industrial workshop to a consumer paradise is just another step along the road towards our final destination as archaeology. The Roman Empire lies crushed underneath East London’s converted warehouses and over time Shoreditch will follow suit – a pop up world waiting to collapse. Soerditch, Diary of a Neighbourhood will be running from 08 Mar 2013 – 26 Apr 2013 @ Eleven Spitalfields Gallery.